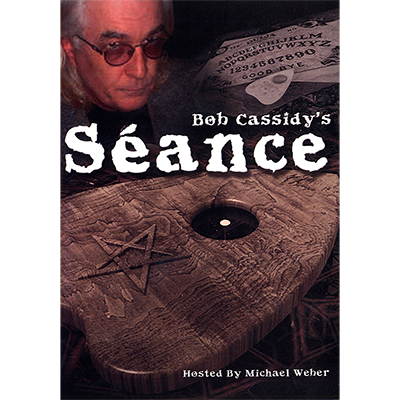 "After 2 Years Of Work Bob Cassidy Reveals His Long Awaited Secrets To The Mysteries Of The Séance..."
It's taken a long time but Bob Cassidy, one of the most respected and influential mentalists of our time, is finally revealing his secrets to performing the séance. How You Can Do A Séance Without Communicationg With The Dead! The EVP Séance - Bob's Powerful Routine For Making Eerie Voices Appear On A Recorded Made During The Séance! Bob has provided an elegant PDF edition of a incredible lost classic 1907 text on seances and mediums, BEHIND THE SCENES WITH THE MEDIUMS, by David P. Abbott. This 173-page text covers the details of seances, reading sealed writings, spirit slates, billets, modern sorcery, mediumistic phenomena, materialization, vest turning, Anna Eva Faye-type performances, and much more.